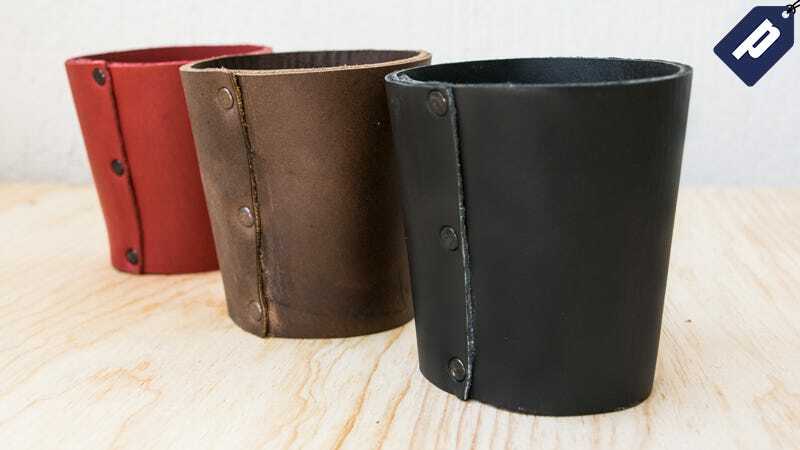 Enjoy your favorite cold brew with the Leather Pint Sleeve from Hide & Drink. Designed to cover the entire base of your drink, dodge a sweaty pint glass while keeping your beer at an ideal temperature. Grab one now for just $8.50 and save 50% with code 50PINT. The Pint Sleeve is hand sewn and made from 100% rustic full grain leather and durable metal hardware, an attractive addition to any kitchen or bar. Hold up to a full 16oz pint glass and move around easily at a tailgate, party, or at home. With 50% off, a Pint Sleeve is $8.50 and comes in Bourbon Brown, Charcoal Black, and Scarlet Red. Plus, Hide & Drink offers additional products such as a leather beer kuzy and coffee/tea sleeve. So if you enjoy the satisfaction of a cold beer, grab the Pint Sleeve from Hide & Drink for 50% off with promo code 50PINT. The Promotions team (we’re on the business side, not editorial) negotiates discounts on notable products and services. If you’re interested in partnering, have questions or comments, drop us a line at promotions@gawker.com.